We treat people for fatigue and digestive disfunction. We take a Different Approach and do specialized testing to investigate the cause of the symptoms in the body which can be: (bloating, gas, constipation, diarrhea, fatigue, light headed, salt cravings, tired after a good night of sleep, colds & flu that last longer than normal). We then create a customized treatment plan to treat the dysfunctional symptoms. Dysfunction is the stage between health and disease. Individuals in this stage will experience some symptoms (fatigue, gas and bloating, etc.) but their medical doctor may not find anything wrong with them. 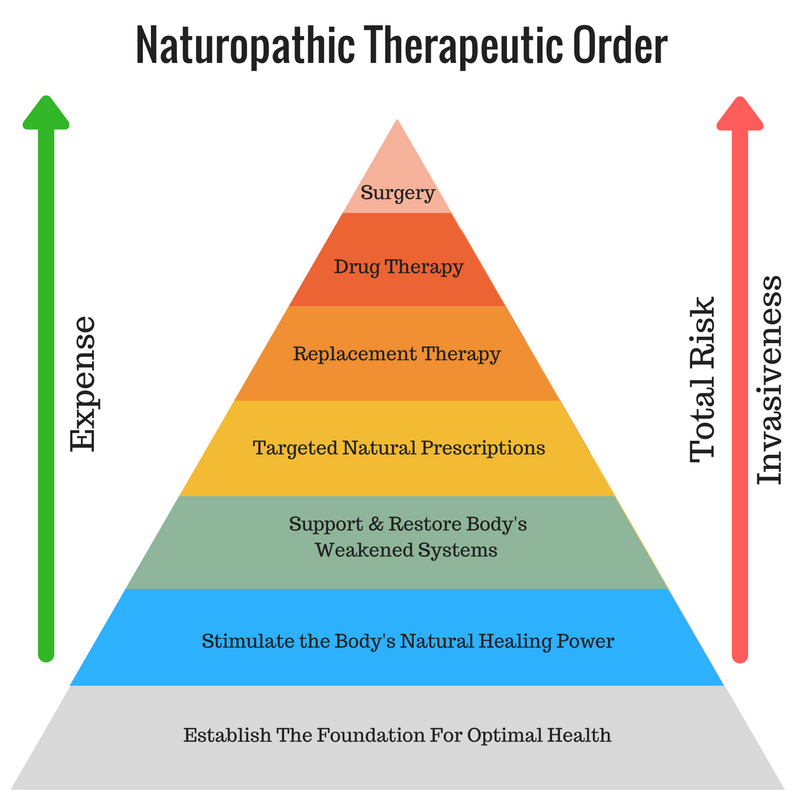 Naturopathic doctors are uniquely qualified to treat dysfunction. We get to the root of the problem and help you feel better. Keep going down to read more about My Approach. Fill out our intake form and schedule a complimentary phone consultation. This is called the Therapeutic Order. It is a guide that naturopathic doctors use to determine which treatments to utilize. The higher you climb on the pyramid, the greater the risk for side effects, the more expensive, and the more invasive the treatment. The goal is to start from the bottom and move up, thus building a solid foundation for your health. The best treatments are the ones that work. Sometimes that means we are starting higher up to control symptoms while we give time for the treatments lower down to take effect. Most of the time we are addressing different levels at the same time. The foundations of health (diet, lifestyle, sleep, stress management) are part of every patient’s treatment plan. The foundations of health must be strong in order to achieve lasting health. Dr. Nancy has changed my life. I was 100% healthy according to all previous “regular” Doctor visits but I always felt off. I have been suffering from migraines since a young age, and it has become worse and worse over the last 5 years (almost everyday). I tried everything and went to see so many different doctors who gave me different prescriptions. Nothing was really working so I decided to go to see “holistic” doctors even if I was preferring the more pragmatic/western medicine. When I went to see Doctor Mach, she was very attentive and asked me a lot of questions to really understand where I was in my life in term of health. We decided to do a food allergy test to see if my body was not tolerated certain type of foods that could cause migraines. Well, the results came back and I had to stop sugar and the combination of grains and potatoes. Sugar is in everything so it is a tough one! But she was and is still here all along with the process of adjusting my diet and even if I know it is hard I can see a difference in my health and that is so rewarding! I feel now that I am more in control of my body and I have now a migraine once every 2 weeks (which believe me, it is awesome even if it sounds a lot) and I take less pills! My goal is to help you become healthier so that you can live more fully. I see myself as your partner and guide and you as an active participant in your health. Many of my treatments are geared toward diet and lifestyle so your participation is crucial. The beauty behind this approach is ..... (click here to read more).